Proper set up, usage, and maintenance can help prevent premature wear and lengthen the life of any hydraulic system. Keeping your hydraulic systems running properly can be quite a challenge. Hydraulic motors and cylinders begin to leak, loss of flow or pressure occurs due to pumps wearing out, valves will not shift or operate properly, and filters become clogged and restrict flow to and from the system. While many of these problems may be due to normal wear within a hydraulic system, proper set up, usage, and maintenance can help prevent premature wear and lengthen the life of any hydraulic system. In this article, we will focus on proper starting and running conditions, as well as on proper system maintenance. Before any of your operators start a hydraulic system, be sure they are aware of the system's basics, including the proper fluid level, the fluid type, and the ambient temperature. 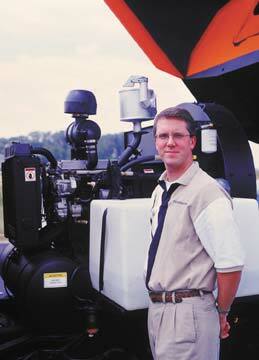 Also, the fluid level in the hydraulic reservoir should be checked before starting the equipment. Many component failures can be avoided just by making sure adequate fluid is getting to the hydraulic parts. A number of problems can occur simply due to the fluid level being low. As examples, not having enough fluid may cause parts to starve for oil (cavitation), or allow air to be sucked into your system (aeration). Not having enough fluid to absorb and to dissipate heat may also make the system run hot. Several incorrect operating situations may cause your hydraulic system to bang loudly. One such example is if a component (pump, motor or cylinder) begins to cavitate. What happens is that liquid vapor bubbles are imploding due to exposure to an increasing pressure. When this happens, it causes severe pitting in the walls of affected components. You may also hear a loud banging noise if any part of your system begins to aerate. Usually the culprit will be a break in the suction line on the pump, but it can also be caused by leaks in other parts of the hydraulic lines. When a system is aerating, the outside air sucked into the system gets compressed by an increase in pressure. This causes the air bubbles to burst, again leading to pitting of the affected parts. Cavitation and aeration will also make your system run hot, because these phenomena reduce lubrication and increase wear in the affected areas. The manufacturer of your equipment will make a recommendation on the type of hydraulic fluid to use. It's important to know exactly what this is, and then to abide by it. This recommendation may vary according to your local climate. For example, a different viscosity oil may be suggested for identical hydraulic systems used in an identical manner when one is located in Phoenix and the other in Milwaukee. That's because the ambient temperature during usage will affect the working viscosity of the hydraulic oil. Viscosity is defined as the "resistance of a liquid's molecules to flow or slide past each other." To use an everyday example, think of syrup as a high viscosity fluid and water as a low viscosity fluid. If syrup is put into a refrigerator for a few hours, then taken out and poured, it may be quite a frustrating wait until the syrup begins to flow. However, if the syrup was heated to above room temperature, it will thin out and flow quickly. The same thing happens to hydraulic oil when it heats and cools. If the operators in Phoenix and Milwaukee are using the same viscosity hydraulic oil in the same exact system, and assuming it is much hotter in Phoenix than Milwaukee, the system running in Phoenix is going to run hotter than the one in Milwaukee. The degree to which one system runs hotter is based on the ambient temperature difference between the two areas. Likewise, in the middle of the winter, the operator in Milwaukee probably will not want to use oil of the same viscosity as the operator in Phoenix. That's because the oil may become too viscous, or 'thick,' for his system to run properly. Some problems with running a fluid that is too viscous include high pressure drops that cause heat, increased power consumption, slow equipment operation, and creation of cavitation. Conversely, a problem with running a fluid that has too low of a viscosity, or is too 'thin,' is lower lubricity. This can cause premature wear, internal leaks and reduced efficiencies. If you are concerned about running proper fluid for your area, contact your machine manufacturer or local fluid supply representative. Once you have established that you are running the correct hydraulic fluid and the proper level of fluid is in the reservoir, you can begin the start-up procedure. Before the hydraulic system has been activated, be sure the system will start in a 'no-load condition.' In other words, the system should have little or no hydraulic pressure at start-up. This situation is created by venting oil from the pump directly back into the tank. 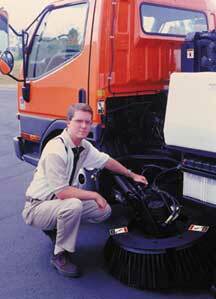 On many sweeper units, this is done automatically within the directional control valves. When no valves are actuated, the oil is allowed to pass through the manifold and return to the tank without building pressure. This allows the system to fill itself with oil and remove any trapped air before trying to do work. Other systems may not have this self-unloading feature and require that a relief valve be turned down to a low pressure so oil will dump back over the relief valve as the pump is primed. (Later in this article we will discuss how to properly adjust and use a relief valve.) Once the system has run under no load for several minutes, the operator should check for any leaks, heat buildup or unusual noises. If nothing irregular is found, normal operation can begin. As stated earlier, the temperature of the oil has an inverse relationship with the viscosity: as the oil temperature goes up, the viscosity goes down (and the oil flows more quickly and easily). Therefore, during normal operation you may notice a change in the speed of your machine as the oil heats up due to the hydraulic system running. This change is normal. However, it may be more noticeable during cold weather because of the larger temperature variation between start-up and operating temperature. hoses and fittings are undersized: this causes fluid to flow too quickly as well as an increase in friction. using fluid with a viscosity that is too low or too high: this causes excess friction or higher pressure drops. having hydraulic component(s) that are worn and/or leaking: this causes inefficiencies in the system. having the relief valve set too low: this is a common cause of problems with hydraulic systems. Many people incorrectly consider a relief valve to be a pressure regulator or a flow control valve. A relief valve is a safety valve against over pressurization. A good comparison for a relief valve is to a fuse or circuit breaker in an electrical box. If a circuit needs 15 amps of current on a regular basis, a 10 or 15 amp fuse would be improper to use in that circuit. Rather, a 20 amp fuse may well be the correct choice because the fuse won't 'blow' unless an unusually high current load is required. A relief valve works in much the same way. If you have a system that will run at 2500 PSI, the relief valve should be set at some pressure above 2500 PSI. If the relief valve is set at or below the operating pressure, oil will pass over the relief valve, thus creating a pressure drop. Since the relief valve opens at a given pressure and cannot 'blow' like a fuse, heat will continue to be added to the system. Therefore, the relief valve should always be set 200-300 PSI above normal operating pressure. Remember that any time the relief valve is opened, heat is generated. If the hydraulic system is being operated in a manner that causes the relief valve to open on a regular basis (e.g., the cylinders are stalling or the motor is under a full load), your system will tend to overheat. Never use a relief valve to control flow or change pressure. Other valves (which are not discussed in this article) are designed as flow control and pressure-reducing valves. If you have any concerns about heat buildup in your hydraulic system, contact the manufacturer of your machine. Contamination is another common hydraulic system problem that can reduce the life of all hydraulic components. Typical types of contamination are air, solid particulates and water. As discussed earlier, air, or aeration, is usually caused either when a pump's suction line is not completely below the fluid level or when there are many leaks in the system. Solid particulates come from several different sources. During the life of a hydraulic system, it is normal for components and parts to wear. This normal wear constantly releases solid contaminants into your hydraulic system. Failure to remove this contamination will result in premature component failure from the particulates pitting and scoring component surfaces. Pumps, motors and valves have metal-to-metal wear that puts metallic contaminants into your system. Pumps, motors, cylinders and some valves have seal wear that puts rubber contaminants into the system. Pumps, motors and cylinders have bearing surfaces that wear, which puts metal contaminants into the system. These are some of the ways that normal wear on hydraulic components can cause a hydraulic system to become contaminated. However, unless proper precautions are made, the external environment can also play a large role in contaminating hydraulic systems. Because your reservoir level rises and falls with system demand, it must be able to 'breathe.' This breathing of the reservoir will pull any available dust and dirt into the reservoir and mix it with the hydraulic fluid that's there. A breather filter is usually provided as a breather/filler, or as part of a separate breather. In either case, the breather must be kept clean and the filler cap must be kept on the reservoir. External dust and dirt can also be introduced to a hydraulic system through component seals. Because pumps, motors and cylinders have an external shaft, some kind of seal must be provided on them to keep dust and dirt out of the system. Since the sweeper environment is inherently dirty, dust and dirt can build up around these seals over time, causing the seals to wear more quickly. By watching these areas and cleaning the shaft seal areas periodically, hydraulic component life can be extended. It's common sense that the more dirt there is next to the seal, the greater the chance for system contamination. Other places that contaminants can enter a hydraulic system are loose hydraulic lines. 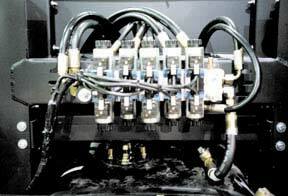 When it becomes necessary to remove a hydraulic component for servicing, be sure to take the precaution of capping off hoses, fittings and manifolds so nothing can enter the system. New hydraulic fluid can also be very dirty according to hydraulic system standards. Care should be taken to filter the oil before it enters into the hydraulic system's reservoir. Because all contamination cannot be kept out of a hydraulic system, the oil must be filtered. Filters should be checked on a regular basis and changed as often as required. Most filters have a gauge to tell when filters need to be replaced. The gauge should have a 'clean,' 'dirty,' and 'bypass' reading. As soon as the gauge reads 'dirty' it is time to change the filter element. If a filter ever reads 'bypass,' the filter element is not being utilized by the system because it has clogged. In other words, the oil is bypassing the filter element and providing no filtration at all. Also remember that particles as small as 10 microns (a grain of salt is 100 microns) can cause severe damage to a hydraulic system. Filters can be located on pressure lines, return lines and suction lines. Many times, if a system has a suction filter, there is no visible gauge to let the operator know when to change this filter. In this case, the filter should be changed after the first ten hours of operation, then about every one hundred hours of operation thereafter. Be sure you or your operator know where all filters are located and schedule regular maintenance for each filter. There is no question that proper maintenance and replacement of filters can add life to all your hydraulic components. The last major source of contamination is water. Water in hydraulic fluid can attack certain seal materials, cause corrosion of metal surfaces, decrease lubricity in the fluid and decrease bearing life. For example, as little as .02% water mixed in with the hydraulic oil will reduce bearing life by 50%. (Source: Machine Design, July 1986, "How Dirt and Water Affect Bearing Life" by the Timken Bearing Company.) Water can enter the hydraulic system through worn pump, motor, and cylinder seals, as well as from condensation and through the reservoir breather. Care should be taken to keep wiper seals clean and in good condition, so they will properly seal against an external shaft and not allow water to enter the system. Water can condense on the inside of a reservoir, or be drawn into the reservoir, if there is no precaution taken to prevent water and water vapor from entering in this manner. Because such a small amount of water can cause problems with a hydraulic system, extra protection against water and water vapor ingestion into the reservoir may be required in your geographical area, or at certain times of the year. Climates that are very dry may not have any problem with moisture getting into the reservoir. Conversely, those in wet and humid climates may see changes in oil coloration when water is present. During the life of a hydraulic system, it is normal for components and parts to wearconstantly releasing solid contaminants into your hydraulic system. Understand that if you can visibly see a change in coloration of the oil due to water, you have already done some damage to your hydraulic system. A lesser known technology to keep water from entering the reservoir through the breather is called a 'hydroscopic breather.' This type of breather uses a silica gel desiccant to 'grab' water as it tries to enter the reservoir. As the gel gets saturated, it changes color so the operator can see it is time to change the breather. This type breather also has activated carbon to remove oil vapors and odors, along with a filter pad that removes solid particles on the upstream side and then regenerates itself by releasing the particles when air flow reverses. If you think you may be having problems due to water being ingested into your hydraulic system, contact your factory representative for more information. Many of the ideas stated in this article sound simple and are good common sense. Even so, the importance of the simple and obvious cannot be overstated. A majority of problems seen in hydraulic systems can be traced back to the simple ideas that were just discussed, such as proper fluid level, fluid type, conditions during start-up, relief valve setting and filtration. Sweeper operators should constantly be looking, listening and feeling for any potential problems that may arise in a hydraulic system. They should look to be sure all components are moving at the correct speed and at the right pressure, listen for any unusual or loud noises emitting from pumps or motors, and feel the components occasionally to be sure they are not overheating. Hydraulic systems are easy to operate and maintain, and can certainly have a longer service life if they are maintained in a correct and preventive manner. You can reach Jeff Earley via email sent to jearl27@aol.com. The Powermotion website is located at www.powermotion.net.